Well the rebuilding of the walls of Jerusalem has ruffled some feathers among the neighboring rulers and they have begun to taunt and make it more difficult for the Israelites to go about their work of building strong walls stone by stone and family by family. The Israelites respond by calling up reinforcements and post armed defenders while they work to rebuild the walls. They even have to have guards when they go for water. They have to divide their time between building and guarding, and they have to carry both a hammer and a sword. An early warning system consisting of a trumpet is implemented to call people to the aid of any section of the wall that is under attack. I am a big Lord of the Rings fan and this reminds me of a scene in the second movie in the Lord of the Rings, The Two Towers. 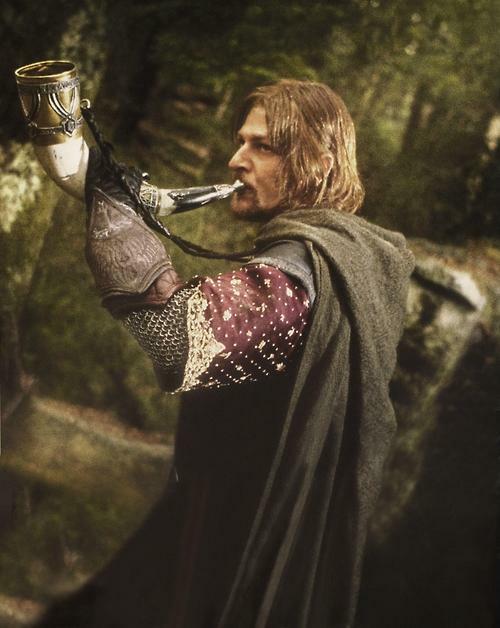 Boromir uses the horn of Gondor to call legolas and Aragorn to his aid. He is under attack by many Uruk-hai (half man and half Orc) and he is trying his best to protect two of the hobbits, Pippin and Merry. Aid does come for Boromir, but not until he is pierced by many Uruk-hai arrows. Aragorn and Legolas are discouraged and heartbroken at the loss of Boromir. This must have been a discouraging time for the Israelites. Many of the people enlisted to rebuild the wall are not professional masons — they are goldsmiths, farmers, and politicians. Now they are called upon to be fighters and defenders while they are working. If we can accept that the rebuilding of the wall in Jerusalem meant more than putting stone on stone, and was in fact a rebuilding of a relationship between God and the Israelites then the resistance and efforts to prevent the rebuilding were also efforts to keep the Israelites from rebuilding a relationship with God. Christians are also in the process of building a relationship with God. Just like the Israelites Christians can encounter resistance and distraction that can slow down the building process. Now I am not saying that we need to carry swords, but we should be aware that there are people and influences in our lives that can distract us from the “building process”. The dynamic of this distraction is presented in a fictional classic by C.S. Lewis called the Screwtape Letters. This book describes the complex spiritual landscape that surrounds us as we go about our lives and how the battle for our souls plays out. God knows that we are not always skilled at the building He calls us to do and He provides what we need when we need it. We can also call out to Him whenever we feel that we need help — blow the trumpet if you will — and He will answer. Prayer: God as we go about the task of building a relationship with You guard our hearts and souls from those who would sabotage our work. This entry was posted in Christian Community, Christianity, Conflict, Faith, Following God, Life Together, Nehemiah, Obedience and tagged bible, bible study, Christianity, Daily devotional, water. Bookmark the permalink.